Posted September 26, 2018 by Sheri Bell and filed under the categories Apologetics, Resurrection, Straight Talk, Talk for Today. The accuracy of history is critical. Even for Christianity. We can look at this photo and make some subjective judgments. We might deduce that the child is somewhere cold. We might also suggest the child’s age, if not also his or her nationality, healthiness, and socioeconomic status. In effect, we’re self-determining this child’s history. It’s a valid question, as history has a history of being written or adjusted to match a personal bias. Both Hitler and Stalin, for example, revised “history” to justify their politics. Tweaking of history is a common practice; too often we don’t realize that its telling lacks truth or objectivity. Ask American adults, for example, what caused the Civil War, and their replies might overwhelmingly point to whether they were educated in the North or the South. In this post, let’s look at the burden that rests on historians, including some of the criteria they should employ as they determine historical “truth.” Here’s the Cliff’s Notes version of this post: History isn’t true “history” unless its facts are presented objectively. Otherwise it’s skewed storytelling, if not outright propaganda. Religion is one area in which truthful, objective history is critical to distinguish between fact and fiction, myth, and legend. Christianity makes historical claims that historians continue to study exhaustively. Some scholars do a great job of being objective; others are unable to get past their personal biases. 1.) Historical evidence must a direct answer to the question asked and not some other question. 2.) The historian must provide not just good evidence, but the best relevant evidence. 3.) This evidence must always be affirmative. 4.) The meaning of any empirical statement depends upon the context from which it is taken. 5.) An empirical statement must not be more precise that its evidence warrants. 7.) The burden of proof rests upon its author. 1.) Pay close attention to historical methodology, including how competing hypotheses are compared and tested, and the manner in which data is collected, analyzed, and contextualized. 2.) The historian’s horizon and method should be public. He should be clear about his guiding presumptions. 3.) Employ peer pressure. Peer critique and analysis can help minimize and check bias. 4.) Submit ideas to unsympathetic (critical) experts for review and feedback to help gain accurate conclusions. 5.) Account for the relevant historical bedrock. Some facts are so firmly established, that any reputable theory must be incorporated or built upon them. 6.) Historians must detach from their biases. They must willingly confront data and arguments that run contrary to their preferred hypothesis. If objectivity is critical to discerning truth, why are historians often willing to slide into subjectivity, relativism, and revisionism? In part because of the influence of noted philosophers David Hume and Immanuel Kant, as well as historian Charles A. Beard. Hume (1711-1776) taught that reality isn’t provable, so one should be skeptical of rational claims of knowledge. Immanuel Kant (1724-1804) argued that the only world knowable is the world we create within our minds. In other words, what’s important is how our minds understand and interpret things, not the way things really are. Beard (1874-1948), heavily influenced by both thinkers, asserted that we can’t expect to know, with certainty, that a historical event actually happened. 1.) History is not directly observable. Beard contends, “The historian is not an observer of the path that lies beyond. He cannot see it objectively as the chemist sees his test tubes and compounds.” Beard is saying that, because historians didn’t see an event for themselves, they can only subjectively view it through the lens of others. Rebuttal: That’s interesting, given that The Big Bang was theorized by scientists based on evidence without direct access to its occurrence. Noted contemporary philosopher Lane Craig reminds us that it is “naive to think that the scientist always has direct access to his objects of study,” especially in highly theoretical fields like physics. Historians need not be held to this standard, when archeological data amply furnishes historians with direct access to the past. 2.) The fragmentary nature of historical accounts. Asserts Beard, “The documentation (including monuments and other relics) with which the historian must work covers only a part of the events and personalities that make up the actuality of history,” so therefore a historian can’t make final conclusions. Rebuttal: Licona pushes back on this. “If we think of history as an exhaustive description of the past, then history is certainly unknowable,” he says. “However, if we regard history as an adequate description of a subject during a specific period, we are in a position to think that history is knowable to a degree. Although incomplete, adequate descriptions provide enough data for answering the questions being asked.” Fischer adds that the suggestion that a historian can’t know anything until he know everything is both impossible and absurd. Science certainly doesn’t hold itself to that standard. Scientists use fossil remains, which represent but a tiny percentage of past life, to reconstruct an objective picture of geological history. Dinosaurs, anyone? 3.) The problem of selection of documentation. Beard says, “Not only is the documentation partial, in very few cases can the historian be reasonably sure that he has assembled all the documents of a given period, region, or segment.” The selectivity in methodology, he asserts, renders history nonobjective. 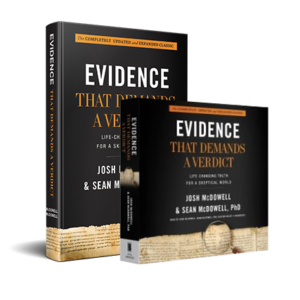 Rebuttal: Yet, as contemporary philosopher Norman Geisler reminds us, jurors, in courtrooms every day, make judgments “beyond reasonable doubt” without having all the evidence. He adds that if the historian has the relevant and crucial evidence, it is sufficient to obtain objectivity. Many skeptics and historians claim that there is no historical proof for Jesus or His resurrection outside of the Bible. Some disregard Christianity’s historical credibility because they find its historians biased, which is a really wonky argument for the New Testament, whose authors spent a lot of time reminding readers of facts and eyewitnesses that validated their claims about Jesus. These skeptics also reject the Bible because it embodies the miraculous. The Red Sea parting? Impossible. Jesus walking on water? Impossible. Jesus resurrected as Lord? Impossible! Miracles are a theological construct, they assert, not a historical one, so the Bible holds no authority for objective study. But we can logically assume that if a historian flat out refuses to acknowledge the possibility of the miraculous, that even if biblical miracles were repeated before their very eyes they would refuse to abandon their anti-miracle bias. If, like Hume, a person believes miracles to be logically impossible, then admitting a miracle becomes impossible for that person. In effect, they box themselves in, in order to hold onto their view. But it should matter more to arrive at the truth, right? Hume, Kant, and Beard would have us believe that nothing is knowable. Well, I suppose we can debate their arguments until cows start milking themselves. But in the real world, their arguments simply don’t hold up. Real truth can be discovered and known, if we seek and test it objectively. Too, we don’t have to know everything about an event, as Beard asserts, to know that it did, in fact, happen. Common sense and real-world experience affirm this, even if philosophical pondering leads us to question even the possibility of reality or objective truth. Hume, Kant, and Beard are wrong about the impossibility of knowing historical truth. There are very good reasons to conclude that careful historians can make accurate assessments of the past, including events considered miraculous. If you’d like to start from the first blog post in this series, click here: Apologetics: Apologizing for Believing in God?.